View More In Computers & Accessories - Page 2. 4 surge-protected outlets provide premium protection for both home and professional workstations. 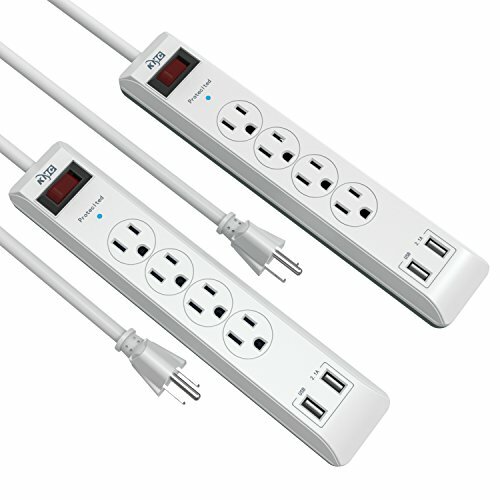 This surge protector is equipped with 4 AC outlets, surge protected from voltage spikes and surges. 2 smart USB ports (2.1A Max) for USB devices, charging your tablets, smart phones & digital cameras and more. 600 Joule energy rating, the surge protector defends your devices against harmful voltage fluctuations, surges, and energy spikes. Protection LED light indicates charging status and let you know it works properly. - 24 months limited product warranty. - 24h*7d Customer Service and Technical Support. 4 standard American outlets with 2-port USB charger allow simultaneously charge for 6 devices like laptop, hairdryer, printer, lamp, cellphone, tablet and more. Mounting Holes easily secure the surge protector to walls, baseboards, or furniture. Heavy duty fire-resistant material and high quality components, ETL approved thicker 5-foot cord to avoid over-heating when using high-end devices, independent power switch and sophisticated circuit breaker design with Over-heated, over-voltage, over-current, short-circuit protection.